The “attendee value proposition” is like a mission statement for your event, and it incorporates questions like: Why is this event important to participants? What is the outcome that we want? What are the meeting’s objectives, and how are they prioritized? Many events and conferences have elements of education, certification, idea sharing, networking, product demonstration, and sponsorship. 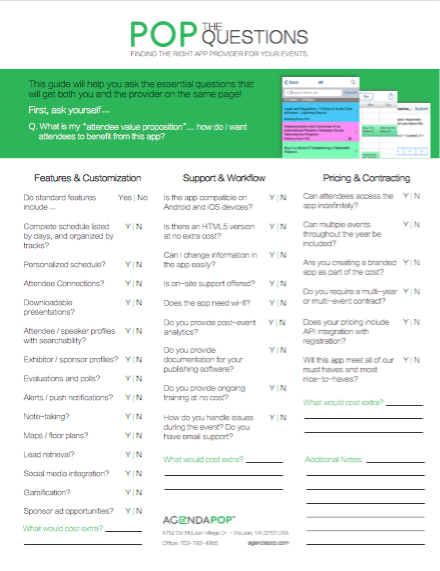 Prioritizing these will help define the app experience you’re seeking. For example, a medical-related conference that highlights research advancements might require displaying abstracts. Conversely, there are meetings where socialization and networking are as fundamental to a conference’s success as the education portion because establishing or strengthening relationships and creating memories are the reasons attendees will keep coming back. There’s no right or wrong because every organization is different. But finding the mobile app that can reflect that experience will make a difference. While industry statistics point to the wide use of mobile event apps, there are still a great number of organizations that are considering using event apps for the first time. The reasons vary, and they include: sustainability efforts; reducing paper clutter; schedule portability; embracing technology; and a demographic shift. First, view several apps from each provider you interview. Think about the demographics of your attendees. From the very first screen, can you envision them quickly understanding how to find the information they’re looking for? If education is important, is the app organized well to show schedules, speaker profiles, downloadable presentations, surveys, polls, and note-taking? If socialization is important, look at chat capabilities, activity feeds, and gamification. Second, gain a good understanding of the provider’s timeline and other requirements to produce the app. Review the back-end publishing tool. Does it seem easy to use? What kind of training and ongoing support will the provider make available to you in the months leading up to the event, and what are the help procedures and availabilities during the event for last-minute changes? 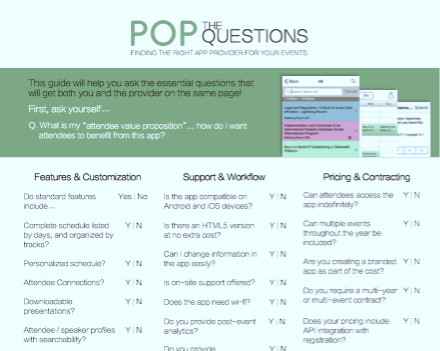 Lastly, review what’s included in the app proposal and what may cost extra. Would you rather try the app for one event and then make a long-term decision, or does the provider require you to commit to multiple events and years? Are you getting a branded app, or do your attendees need to download the provider’s app first and then search for their event? Are there fees to integrate with your registration platform? Is the provider charging an annual fee? Can the app perform without Wi-Fi? Reach out to references. Don’t assume that the most well-known names in the app industry are the easiest to work with, or that a higher price means it must be a better product. Pricing varies widely across our industry, and that contributes to a lot of head-spinning among event planners.